College was a big change for me, maybe also for others. Many students came from different places, and using different languages. For example, in my dormitory, we came from all over the Philippines. From Leyte, Samar, Bacolod, Masbate, Zamboanga and Palawan. It was a chaos for me as a province girl, now living in a big old city. First day of class in college, and everyone needs to introduce themselves. Name, from what school, and where you came from. Of course I got my turn, I introduced myself and told the whole class I’m from Tandag, Surigao del Sur. Not sure if everyone does know where I came from since most of my classmates are from the city. But there’s one person asked me. Well, I believe she asked me if I’m living inside the jungle and not just around coconut trees. But for the first months of living in Cebu, I got a lot of questions about where I came from. Like..“Have you experienced bombs?” , “There are a lot of NPAs there, right?” , “Is your place near Zamboanga?”. I’m not criticizing them for their poor geographical skills nor what they saw from the media about Mindanao, but sometimes it’s difficult to share in details about my place. I just answered those questions with a ‘Yes’ and a ‘No’. Simple and not complicated for both sides. Since I’ve been writing to all the places I’ve been. I guess this is my chance to introduce where I came from. And now that I’m starting, I must say that it is more complex to explain the place where I spent my whole life than the place I’ve been to for a few days. I actually don’t know where to begin without getting too emotional. Can you feel me? Haha. I guess I just have to do it in my own way for the best way you can relate. That’s why I will share with you some tips and places you can go in this region I call home. Surigao del Sur is a place where each town has a different variation of Surigaonon. As you travel and hop in different towns you can see different versions of ‘welcome‘ and ‘thank you for coming‘ along the road. We call some waya-waya, waza-waza, and my dialect is Tandagaonon use wara. The southern part speaks kamayo, and some speaks bisaya especially those towns near Agusan del Sur. We know what part of Surigao del Sur a man is from the way he speaks. You might think this is too confusing to us, but we manage to understand one another despite the slightly different languages. Our developing province is facing pacific ocean which made us prone to typhoons. Signal no. 1 sounds ordinary to us. Even without low pressure area, we experience heavy wind when raining. Aside from that, facing the pacific gives us good waves that can be dangerous and enjoyable at the same time. We also have vast land and forest with waterfalls. I must say we have a lot and we actually don’t know how many are discovered and about to discover. Surigao del Sur has much to offer and it maybe underrated destination, but once you’ll see its beauty, it is not just ordinary. How to get to Surigao del Sur? By Air – There are various ways to go to Surigao del Sur. I used all the below options in the following order when I go home. Option 1: Tandag City – There’s a flight to Tandag City, the capital of Surigao del sur and also my home town via plane, but the schedule is only MWF and it is only once a day. Note that this is route is only available in Cebu Pacific Air. Option 2: Butuan City – This is in Agusan del Sur. From here you can take a van or bus going to Surigao del Sur. For example in Tandag, it will be a 4-5hours trip. Option 3: Surigao City – Located in Surigao del Norte. It will take 5-6hours bus or van from Surigao City to Tandag. But depending on your route this can be your option 2. By Sea – Not the best choice but if you have a lot of time, you can go to Surigao via ferry. Cebu to Surigao City – You can take Cokaliong Shipping Lines departs 7PM every day. It’s a 12 hour trip so it’s basically one whole night. Fare is Php850.00 for economy and Php1025.00 for tourist. Then you can take the bus or van going to Surigao del Sur. It will be 5-6hours trip. Cebu to Butuan City – You can take also Cokaliong and take a bus for 4-5hours trip to Surigao. Depending on your route. I did my first ever surfing trip here and I wasn’t prepared! Haha. This is the only known surfing spots in Surigao del Sur. They have Surfing Festival on November which is the best time to travel and surf here. Accommodations – There’s a lot of home stay around Lanuza. But if you can afford more you can check Babak Bongalows. Also, there are a lot of spots in other towns, especially in Cantilan, Tandag, and Cortes. Just ask the locals for the right direction and also be guided since those spots since are not touristy and it might lack of safety percussions. Visit Laswitan in Cortes. The Laswitan is actually a 20-foot rock formation facing the ocean. The waves crash the rock and it would flow on the other side creating a waterfall effect. It is best to view the “laswit” during December to February when the waves are high. The lagoon can fill up 200 people. Laswitan will be close at 5:00PM. Accomodation – Php800.00 per head at Kamalig. Enjoy this mini Boracay minus the crowd beach in Surigao del Sur. But just in case you like the crowd, you can visit the beach during Kaliguan Festival. This celebration lasts for a week celebration during the Feast of St. John the Baptist. Accomodation – Many resorts around the area. LGU Cagwait beach resort is more affordable. Composed of 24 islets and only few can be visited since most of the islands are uninhabited. These Islands have different forms and beauty to offer. Some have wonderful rock formations, some are naked, just pure sand. Accomodation – A lot of Inns nearby. One of the famous tourist destination in Surigao. I first visited this last 2012 and my recent visit was on November 2016. This beautiful river never changed! Still it has a clear water where you can see the beautiful rock formation and the fishes under. They feed the fished at noon and the facility closes at 5:00PM. Meet Brenda in Sibadan Fish Cage. She is a very nice stingray. 🙂 You can swim with her along with the other two stingrays and big fishes in the cage. If you’re brave enough, you can swim with the seven baby sharks who are almost 5 feet long. Also, aside from the swimming activity. Try their fresh seafoods. I assure you, it is very delicious. Accommodation – From enchanter river you can stay the night here in Sibadan Fish Cage. Well oh well. This is the widest falls in the Philippines. It measures approximately 55m high and 100m wide. It is also a multi-tiered waterfalls. For me the best time to visit is on summer where the water are enough so that you can swim under the curtain drop of waters. 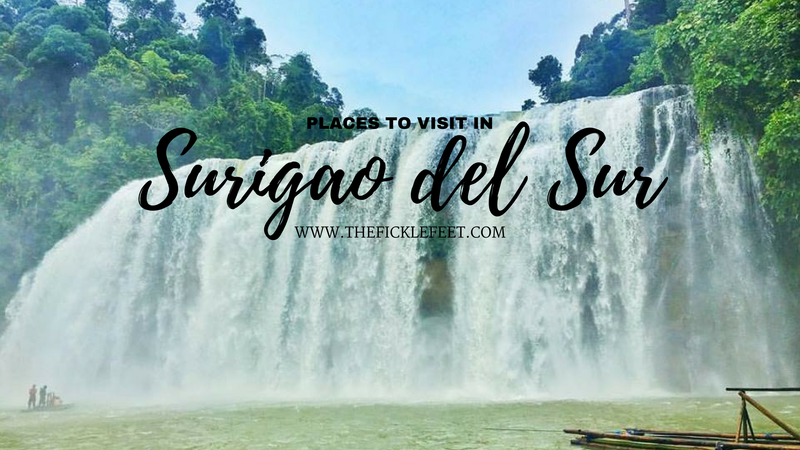 Have you been to Surigao del Sur? Or you want to visit? Share your thoughts on the comment box below! My mom is from Tandag and I finished high school in Mangagoy. But it’s been so long (almost 17 years) since I last went home. Too many tourist spots these days. Sa una wala pa jud na. Haha! Oh! Hello Rose. You should come and visit again. It may have a lot of tourist spots now, but it still is a sleepy town for me, I’m talking about Tandag. Hehe. I’m probably one of those people with poor geographical knowledge. I chuckled a bit cause I’ guilty. And yes I will ask you about bombs and all haha. Laswitan looks awesome. I’ve seen a video of the place somewhere in FB and I got curious. Will definitely add it on my list.